Cecil Victor Wilman was born in the school house in the tiny hamlet of Caswall on the Herefordshire - Wales border. His parents Stanley and Ethel Wilman were surprised when Cec arrived unexpectedly as a second twin. Cecil's brother Derek was born twenty minutes earlier. Consequently, his parents were unprepared with a name for him, so he was called ‘Cecil’ after his Uncle who had died a few years earlier during the First World War. The twins had one older brother Ralph who was three years older. Exactly to the day, three years later their younger brother Roy was born. Cecil always grumbled that he had to share his birthday, presents and cake with his two brothers. Cecil loved his latter years birthdays so he could enjoy a whole cake to himself! When the twins were toddlers the family moved up to Pontefract in Yorkshire where their father was Headmaster of a Primary School. Cecil, with his identical twin brother Derek, attended Doncaster Grammar School for their secondary education and they loved to interchange roles with each other, causing much confusion for other pupils and the teachers. However, it was not too long before the teachers realised that Cecil was the one often to be found sitting at the back of class, where he mended watches and clocks during the lessons when he could get away with it! After matriculation, Cecil went to study for an engineering apprenticeship at Ericsson in Nottingham. He continued his studies at the same time, at what is now Loughborough University School of Engineering, to pass his exams leading to chartered membership of the Institute of Mechanical Engineers and the Institute of Electrical Engineers. By 1948 Cecil and Derek had bought a new house together at Long Eaton Nottingham. Cecil had met Edna whilst he was recovering from an appendix operation in a nursing home. Edna was his nurse. Within a short space of time they were married at St Peter’s Church, Ruddington, Nottinghamshire. Edna joined the twins in the new house and when departing on honeymoon to Barmouth, Derek went too! Luckily then, within days Derek fell in love with Gwen whom he subsequently married, and continued to have two children Paul and Ruth. Sadly, Ralph the older brother passed away leaving a widow Raie and two small children Beth and Stanley Peter. Younger brother Roy married Margaret, Edna’s best friend and soon Peter and David followed. About this time, when Cecil was an apprentice for Ericsson’s Nottingham as an electrical Engineer, Cecil often recounted the tale that during his training with the company he and a colleague were sent to work in a local mental hospital to install a new telephone exchange. They were working in this large empty room fitting cables, wearing their blue work overalls and crawling around on their hands and knees. At that moment, several dignitaries walked past the room on an inspection tour. A few days later, there was an article published in the Nottingham Evening News drawing attention to ‘the poor and terrible conditions that patients endured, left to crawling around special rooms on their hands and knees!’ Fortunately, Cecil found this account of himself and his colleague amusing! Cecil and Edna moved south in 1951 and he took up a position as a scientist at the Admiralty Surface Weapons Establishment on Portsdown Hill. Within the next five years Michael and Candy were born. One of his major projects was working on a radio communication system for submarines which involved developing a powerful long wave transmitter which bounced signals off the ionosphere and were picked up by submarines anywhere in the world. The submarines had a trailing aerial array floating on the surface. It was the first time that submarines were able to travel underwater and still receive radio messages. On being posted to Malta in 1958, Cecil worked on a major project to implement the Sea Slug Missile system on specially converted guided missile destroyers. There was a major glitch when the missiles would not travel along the rail system inside the ship, and Cecil had to travel back to the UK to find out the reason – he eventually found some technicians in the workshops who told him that they simply had to file down the metal shoes on the missiles, thus allowing them to fit on the track properly! His last job was as Deputy Director of Underwater Weapons at the Admiralty Underwater Weapons Establishment, in Weymouth, and one of his last projects was the development of the sophisticated lightweight Sting Ray torpedo, designed to be fired from ships as well as Nimrod maritime patrol aircraft. This was considered to be the most advanced lightweight torpedo in the world when it came into service in 1982-1983. Much of the development work was carried out by Marconi Underwater Systems in Waterlooville. 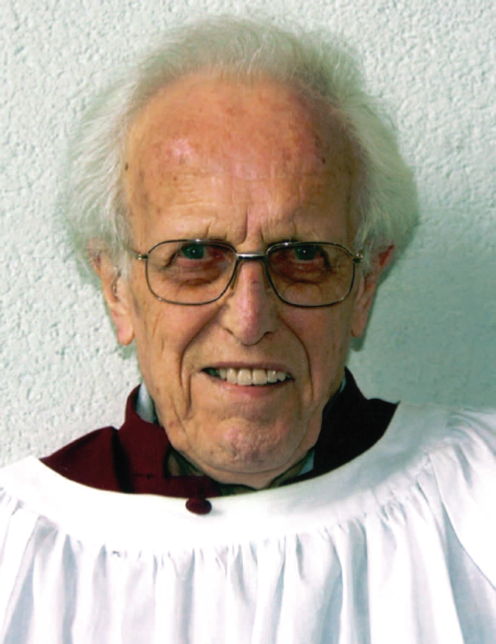 Cecil was a valued and active member of St George’s and was Organist for many years. Upon his retirement from that position, he was appointed Organist Emeritus.